Note: This is an improved version of my original solution to this problem. As a reminder, the problem to be solved is to have screenshots automatically appear in Yoink as they are taken. Again, as a reminder, on macOS, screenshots are saved to the desktop as files with names of the form Screen Shot YYYY-MM-DD at HH.MM.SS.png, e.g. Screen Shot 2017-11-22 at 22.30.10.png. And one final reminder — Hazel is an app that watches the filesystem for events, and executes actions in response. Hazel rules are added to folders. My original solution was to add a Hazel rule to the desktop folder with the condition Name starts with Screen Shot and a single Shell script action which used the open terminal command to send the screenshot to Yoink. The good people at Hazel replied to my tweet about the original post with a suggestion: I think you can do the same thing without a script. Try using the “Open” action. Unsurprisingly, the Hazel suggestion proved to be spot on. As you can see, the resulting Hazel rule is now impressively simple — one condition, and one action. You can download an export of the Hazel rule here (it needs to be applied to the desktop folder to work). 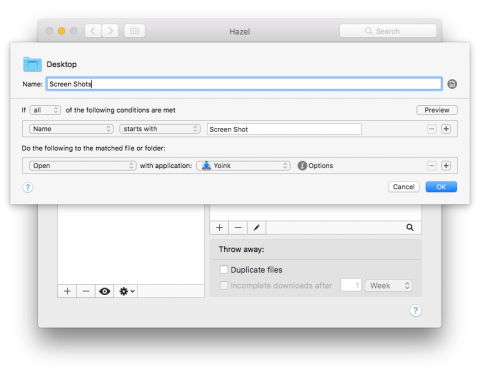 Is hazel sort of like Automator folder actions?